The beauceron breed of dogs was developed in the 1500's in France. This is a large sheep dog breed falling into the working dog category. This breed is also known as Berger de Beauce and Bas Rouge. 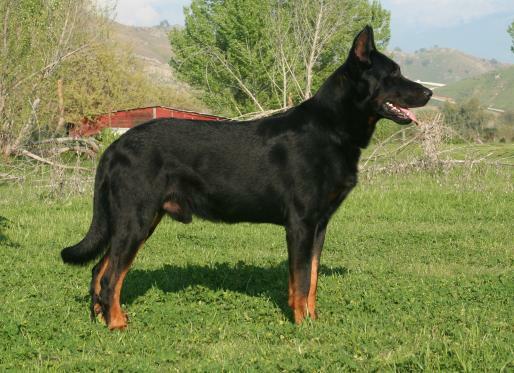 The beauceron is used by farmers to guard and protect cattle, sheep and family. The french army also used this dog breed as messengers during the world war I and II, the breed was well appreciated for its ability to detect mines. follow orders, and follow trails. Nowadays the breed is used by military and the police because of their excellent abilities and are also kept as companion dogs. Beauceron is a tough breed of dogs that is generally health and is not known to be susceptible to many disease. However, the following diseases or disorders have been known to exist in this breed of dogs. The average life span for this breed is 10 to 12 years.